Multi-cylinder model aircraft engines add an incredible degree of 'wow factor' to any model, whether inline, opposed, or radial. From a functional perspective, multi-cylinder engines are notable smoother in operation because when properly configured the pistons are moving in opposite directions and therefore tend to cancel each other's mass acceleration. More cylinders gets more vibration cancellation. Torque effects are the same as for any equivalent displacement engine as engine speed changes. The other great advantage of a multi-cylinder engine is better idling characteristics. Producing a multi-cylinder engine take more than simply coupling two or more engines to the same thrust line since timing issues, even with glow engines than have no separate ignition systems, perform better when the entire engine is designed to coordinate all cylinders. This article covers many different configurations. Who wouldn't like any one of these babies sitting on display? It is a known fact that vibration all but disappears when another cylinder is added. In his research and development, the author also achieved low dependable idle. Explained are the results obtained from various arrangements-feasible if you can use tools. Linked-together engines of different displacements may be the ideal, Bill believes. This example consists of a McCoy .35 cylinder in front, with McCoy .19 for rear. Separate crankcases as well as carburetion. Photos by Lane Bros. and John Schneider. A new era for RC flying is here. First is the improved airplane capable of unbelievable speeds and maneuverability, yet docile enough to land at reasonable speeds. Second, the excellent proportional radio equipment now available makes intricate and precise maneuvers possible. Third, improved RC engines give the airplane performance and respect far more than once thought possible. 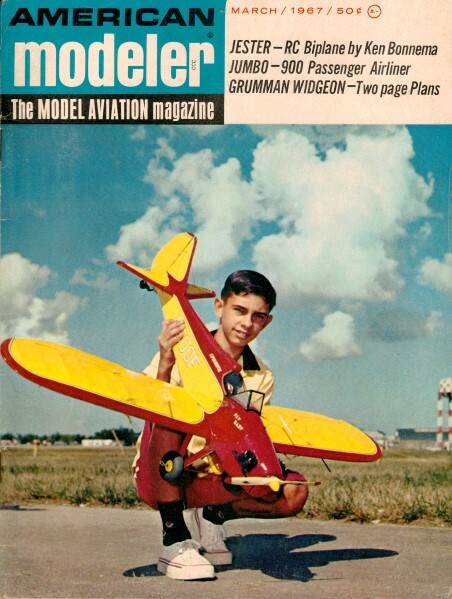 In the field of model engines there are mainly two improvements to be sought. One - less vibration; two - low, dependable idling. Like "the jewels of the sea" we have the "jewels" of the model engine industry at our finger tips just waiting to be developed. Examples of alternate firing experiments, Mac .35-.19 (above), and two O.S. 30's (below) which indicate better idling, linear throttling compared to simultaneous-firing opposed twins. Separate tubing from bottom of tank to each carburetor a necessity. There are no starting difficulties; fuel consumption about equal to equivalent single. I will endeavor, though crudely, to present a method by which certain standard single cylinder RC engines can be joined to form multi-cylinder engines, along with various combinations of displacements and firing orders. The following classification will indicate those combinations under consideration. 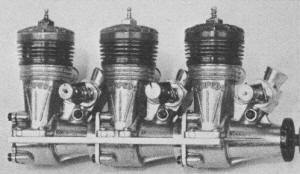 1) Alternate-firing twin-cylinder engines of equal and unequal displacement; 2) Simultaneous-firing (opposed) twin-cylinder engines of equal and unequal displacements; 3) Alternate-firing three-cylinder engines in-line - that is, one cylinder behind the other - of equal or unequal displacements. Two things are to be gained from the end results of joining two smaller engines together. They are: 1) Less vibration, 2) Lower dependable idling. One does not gain more power than expected from equal total displacement as compared to a single engine. Simultaneous opposed twins, two Max .30's. Classification 1: Several alternate-firing engines were joined (each cylinder firing at exactly 180 degrees to the other); in other words, each cylinder fired once every time the prop made one complete revolution. 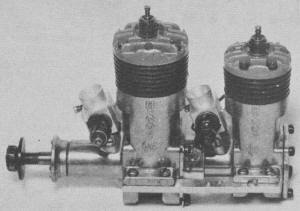 The first engine was of equal displacement using two O.S. Max RC .30's. The next alternate firing engine was of unequal displacement - a .35 McCoy RC with a .19 McCoy RC in the back position. Both combinations ran smoothly and idled nicely. Classification 2: By separating the two alternate-firing engines and rotating them 180 degrees and re-assembling, I formed two simultaneous-firing engines - both combinations ran smoothly but, there was an obvious difference in dependable idling. These engines would not idle as low as the alternating-firing engines. Classification 3: This combination was composed of one K&B .23 RC and two K&B RC .19's, one behind the other in this order. 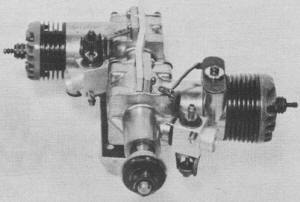 The firing order was 1-3-2 cylinders at 120 degrees to each other. I had to solicit the use of a starter to wind this combination up. Its "whine" resembles that of a six-cylinder car motor. I see no real need for this three-cylinder engine at present, but just wanted to prove to myself that almost unlimited combinations of engines can be joined together using this method. 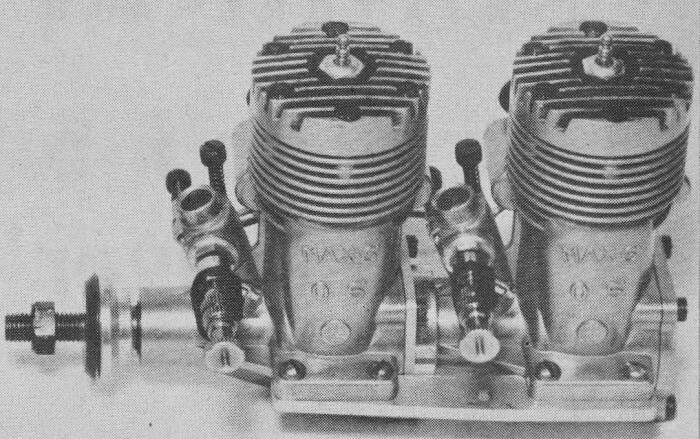 Another simultaneous opposed twin, two Max .30's . These are the same engines used in the assemblies in top photo. 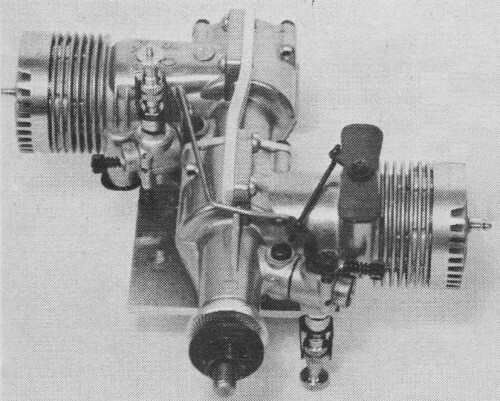 During many hours of flying and bench testing of various combinations of engines several observations were made in respect to the desired improvements; they are as follows: 1) Vibration markedly decreased with both alternating- and simultaneous-firing engines; 2) Dependable low rpm's in alternate-firing engines is about half that of the simultaneous-firing engines (these measurements were made with an electronic tachometer); 3) Linear Throttle - which should be of particular interest to the rudder-only flyers - where throttle is elevator. The alternate firing engine seems to be more promising in the direction of the "ideal" RC engine. It was also noted that engines linked together of unequal displacement will tolerate each other nicely and operate as a unit beautifully. These unequal displacement combinations may well be the right approach to the "ideal" rather than the equal displacement combination. Simultaneous opposed twin, and Mac .35 and .19. 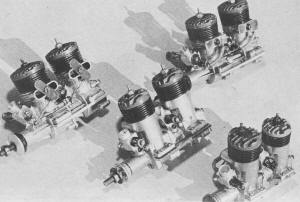 All engines used in these tests were standard RC engines - of course, their crankcase pressures, etc. were separate. This setup certainly has its advantage over a single crankcase where both cylinders are fed from a common crankcase. The choice of alternate firing engines in the .60 category tested thus far is two K&B 29's converted for RC operation. Fuel consumption is about the same as the average single-cylinder engine of equal displacement. Using an electronic tachometer with the engine on a testing bench, 12x5 Top Flite prop, 5 per cent nitro-methane in 3:1 methanol and oil fuel, the following rpm's were noted: dependable idling was 1300 and top speed 10,500. With hotter fuel I feel sure top rpm could be raised. Operation: No combination of engines presented any starting idiosyncrasies - no more than one finds with the single-cylinder engine. 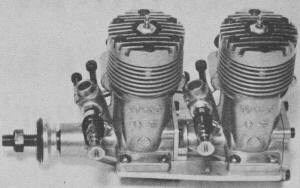 The carburetor adjustment is not difficult-about the same procedure as would be followed with single-cylinder engines. I do feel that a separate carburetor for each cylinder has a definite advantage of providing finer adjustment to each cylinder's need. Separate tubing from bottom of tank to each carburetor is a necessity - to prevent one cylinder from starving the other out and consequently causing the engine to stop. Two K&B .35's (left); two K&B .29's (upper right); two McCoy .29's (center); McCoy .35 and .19 (lower right). Assembly instructions outlined in text. 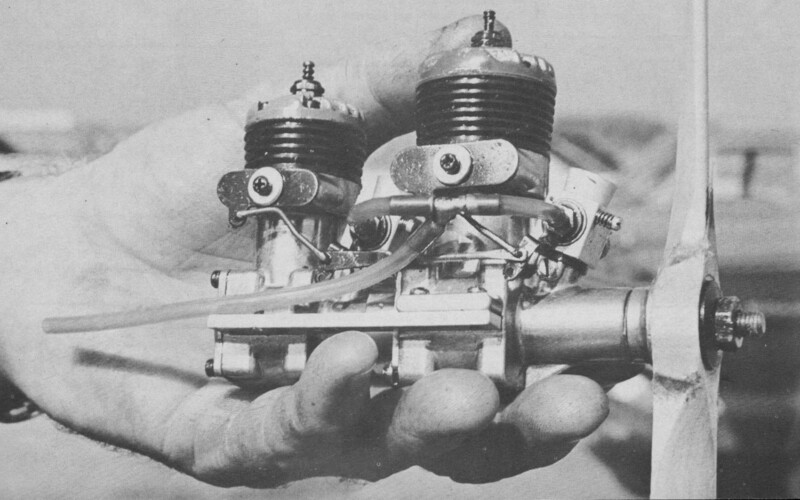 Construction: Three parts are to be made: 1) A new back-plate for the front engine, which is press fitted on the rear engine's crankcase (made from hard aluminum); 2) A rotor adapter disc which fastens to the rear engine's crankshaft (made from cold rolled steel); 3) A small pin pressed into the role made in the crank of the front engine's shaft (made from drill rod). The rotor adapter disc is fastened to the crankshaft by counter sinking a hole at desired position into the shaft. An allen screw (as shown in sketch) is used for this purpose. 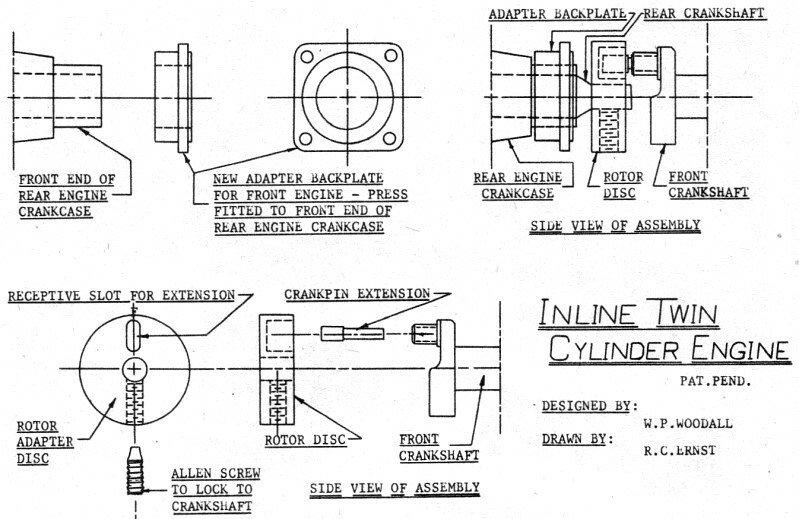 The threaded part of the rear crankshaft is removed flush with the rotor adapter disc. The rotor adapter has a counter-sink to fit the added pin placed in the front crank hole which links the two crankshafts. This rotor adapter disc is so placed that after the crankshaft linkage is made, each crank will be exactly opposite or 180 degrees to the other. When these parts are in place the engines may be united and fastened with four backplate screws. A brace made of 1/8" hard aluminum is bolted on each side to the normal motor mounts, giving added strength and new mounting areas. I used only one 4-40 bolt with a lock washer on either side for mounting to the airplane. The linking and adjusting of the carburetors and exhaust baffles should be made to make the carburetors and exhaust baffles open and close the same. This has a decided effect on the idling characteristics of the engine. Three K&B .19's confirmed combinations almost limitless. Conclusion: My opinion is that the alternate-firing twin-cylinder engine, equal and unequal displacement combinations, has a definite advantage over the simultaneous-firing (opposed) engines, only in better idling, and linear throttle. Vibration tendencies are about the same. I have had many hours of pleasure flying these different engines. All of them have performed well - in the air and on the ground. I sincerely believe it will be worth your time to construct one of these combinations and fortunately for those without the necessary equipment or time, Champion Products, 5620 New Peachtree Rd., Chamblee, Ga. is now tooling to produce the K&B Twin-29 RC. 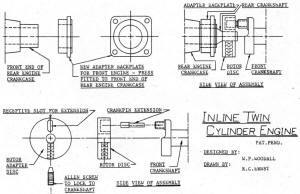 Inline Twin Cylinder Engine Mechanical Drawing.